Adventure Map: Spain Portugal  - $9.95 : Trail Explorers Outpost, Keeping the Adventure Alive! 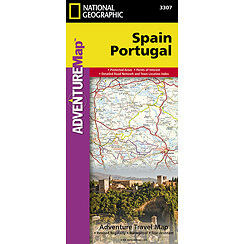 National Geographic's Spain/Portugal AdventureMap is designed to meet the unique needs of adventure travelers detailed, durable, and accurate. Spain/Portugal includes the locations of thousands of major cities and towns with an index for easily locating them, plus a clearly marked road network complete with distances and designations for expressways, motorways, and more. What sets National Geographic AdventureMaps apart from traditional road maps are the hundreds of points of interest that highlight the diverse and unique destinations within Spain/Portugal. National parks, World Heritage sites, caves, scenic viewpoints, archeological sites, museums, castles, churches, monasteries, and ruins are included, making it invaluable to travelers hoping to experience all the history, art, and culture the countries have to offer. Additional aids including the location of airports and airfields, hotels, campsites, lighthouses, ferry routes, and border crossings with checkpoints make travel within and beyond the countries easier. The front side of the Spain/Portugal map shows the eastern half of Spain from its northern borders with France and Andorra south along its Mediterranean coastline to Almeria. Portugal and the western half of Spain including the Canary Islands are covered on the reverse side of the map. Our Spain/Portugal AdventureMap is printed in the U.S.A. on a durable synthetic paper, making it waterproof, tear-resistant, and trail tough - capable of going anywhere you do. The map is two-sided, and can be folded to a packable size of (4.25 x 9.25), unfolded size is (26 x 38).